After yields rose from around 1.7% in early 2013 to over 3.0% just a few trading days ago, the 10 year treasury bond is incurring an emotion from the market it has not experienced in a long time; dislike. 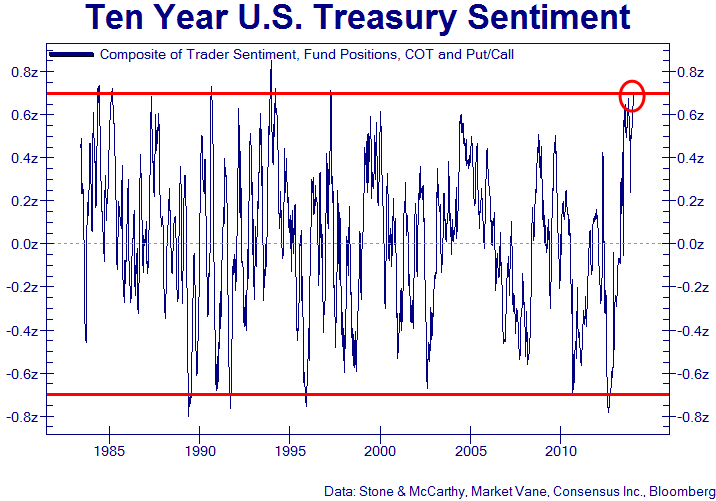 The chart below shows that sentiment toward treasuries is hovering close to 20 year lows, meaning most investors believe that yields will continue to move higher. This is due in large part to the much touted "great rotation." Since investors now believe it is an impossibility for stocks to fall more than a few hours before reaching new highs, the market "knows" that money will continue to move out of bonds and into stocks (as it steadily has over the last 8 months). The market also incorrectly believes that the U.S. economy is now entering the next acceleration phase of an economic recovery. This has historically pushed bond yields higher. An investment becomes attractive when it is disliked by the market, prices are low and the long term fundamentals are strong. Right now treasuries have one of those boxes checked (disliked by the market). How about numbers two and three? Going back over one hundred years of data shows that even with the most recent rise, treasury yields are still extremely low (meaning priced extremely high). The fundamentals are worse. If you were to take five minutes to discuss the debt market in the United States to an eighth grader, they could quickly understand that the market is a ponzi scheme waiting to erupt. The government will most likely issue less that $700 billion in new debt this year (an enormous improvement from the $1.4 trillion in 2009). What most forget is that when the existing bonds mature, they must be immediately refinanced. How large is this adjustable rate refinancing bill? It is currently running at over $100 billion per week. This is actually an improvement; in 2013 the government had $7.5 trillion in debt that matured and needed to roll. In other words, if the holders of U.S. debt decided that they did not want to "roll" their worthless I.O.U. 's and take just a small fraction of their bond maturities in cash, then the game would be over in just a few hours. The Fed's (already ridiculously large) $480 billion in annual treasury purchases would only be a small down payment on what is needed. 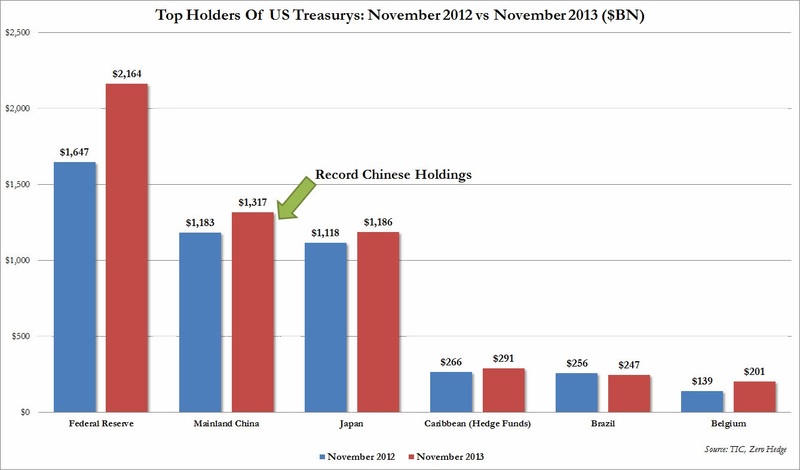 The TIC data this week showed that China increased its holdings of U.S. government debt to over $1.3 trillion. This was another sign of "strength" in the bond market. China is just a hair ahead of Japan in U.S. debt holdings but a mile behind the Federal Reserve. My question is, what if China, Japan or the Federal Reserve were forced to become sellers of U.S. treasuries? China and Japan both will face an internal funding crisis over the next few years. China's is due to the leverage used to fund domestic investment and Japan's is due to their government debt burden. If they need cash, which they will, they may decide to ask for a payment on some of their U.S. debt that is rolling. Ultimately there is only one way for this story to end, which is a much larger monetization of the deficit from the Federal Reserve. While the Fed may continue to taper in the short term, over the long term they will continue to increase their share of treasury bond ownership until the system breaks.